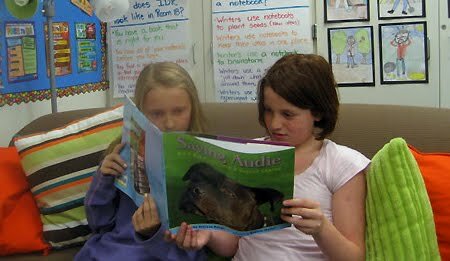 Recently elementary school teacher Charity Allison-Jara presented the book to her fourth grade class at Vintage Hills Elementary School to gather their impressions. Their community in Pleasant Hill hasn't had much experience with pit bull type dogs and breed stereotypes are more common than truths, so this would be a very different kind of story for most of the kids. Her students' response to the lessons showed the impact this type of story can have on young minds. 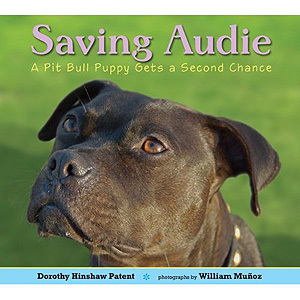 Audie ceased to be a "type" of dog, and instead became an individual with emotions and a hope for second chances through the book's words and images. 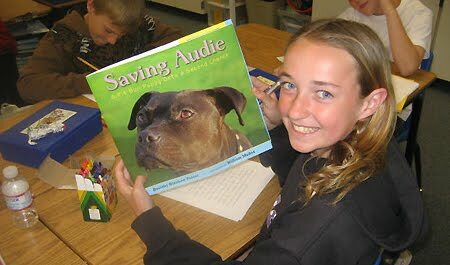 The kids' essays about the book were lovely, but when Charity came back to school the next day, she was surprised to find a real live demonstration of the kids' newfound compassion for orphaned pit bulls -- they brought in a PILE of toys, treats and blankets; gifts for the homeless dogs in BR's barn. The kids had gone home to their parents and relayed the story, inspiring several visits to shops and pet stores to gather up help for the orphans. It was a wonderful confirmation that the book had hit its mark. Very cool! 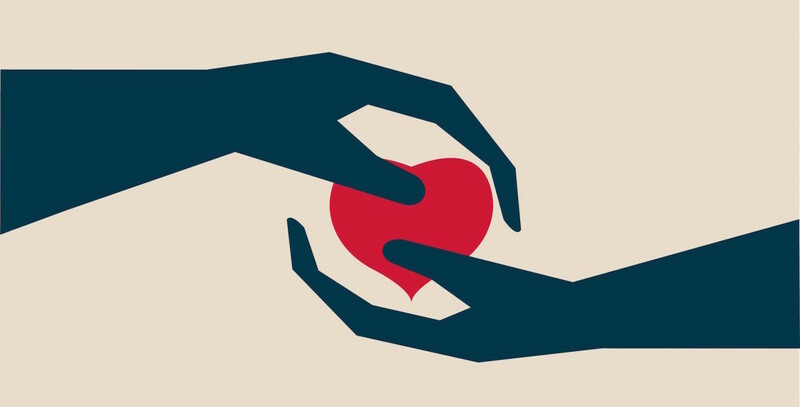 Complimentary Lesson Plans: Charity kindly shared her lesson plans with us for the teachers, humane educators, librarians and parents among us. Feel free to print them off and share them around. Our only request is that you report back so we can learn about the response you receive. Right: Yes it seems terribly wrong, but there's actually a good reason Audie had to wear those pants. Ask the kids. They'll explain. We want to thank the students from Mrs. Allison-Jara's fourth grade class for telling us what you thought about the book, and for extending your kindness to other dogs that don't have homes right now. You made lessons from Audie's story come to life in ways we didn't expect and our dogs are happier because of it. Thank you! Below: 'Zack' enjoying his afternoon with one of the toys sent from the big hearted kids at Vintage Hills Elementary School. Don't let the unassuming look on this dog's face fool you. She's a history maker, even if she's still trying to sort out the difference between leather shoes and chew toys. 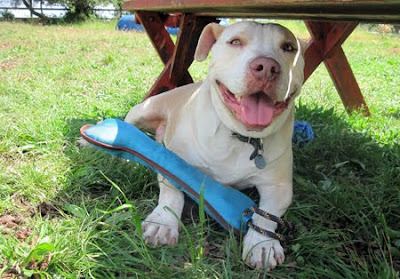 'Joliette' was recently selected to be the first ambassador for pit bull type dogs in the adoption wards of the Cleveland Animal Protective League, the largest humane organization in the state of Ohio. She found a quick home last week, which brought an end to the decades-long ban on pit bull adoptions from this influential shelter. 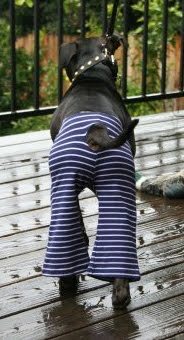 Her departure opened a kennel to another square headed dog, and signals a change as welcome as the spring temperatures. The pup doesn't seem to understand why people from California to New York were dabbing their eyes up when news hit that she'd gone home ... Political milestones are such human inventions. Welcome to warm laps, tug toys and a lifetime's worth of family photos, little darling. And thank you CAPL for getting her there. There was some chat on the Net today about a Today Show piece that highlighted a program to end dog fighting. The report was peppered with formula clips of dogs engaged in bloody battles mixed in with young black guys who've changed their ways. It was a schizophrenic five minutes as far as the dogs were concerned: dogs acting scary, dogs climbing agility equipment, more dogs acting scary, finished with a cute dog who wowed the show hosts with cute tricks. The report raised eyebrows from people who've been watching this campaign work its marketing pitch on the general public. (Yes - of course the campaign is marketed. Every well-funded campaign is marketed.) We noted the audible silence of our colleagues as well as the predictable shock and horror reactions from the public: "Dog fighting is so so mean and someone needs to stop those thuggy people from doing it." Right - Okay. But let me tellya my fine white friends: Young black guys in select neighborhoods in select cities are - proportionately - not a particularly big threat to the state of pit bulls in this country. And as far as we've noted in our work with municipalities near and far, dog fighting is not nearly the epidemic it's been made out to be. It's out there, it's awful and we want authorities to stop it - but it's not a so-called epidemic, worthy of juxtaposing violent images of dogs being slaughtered next to the faces of repentant young black men on the Today Show. America believes differently though. Last weekend a student reporter came to our shelter-based training class, hungry to write a report on dog fighting. He chatted excitably about the epidemic that's everywhere. Did we have any former fighters we could point out to him? His buddy stood by with a camera, ready to grab images. I scanned the 40 or so dogs doing drills in front of us and did a quick inventory. Hmm. Not today. Maybe next week. "How about that one with the scratches on his face?" "Yeah - he's a Dogo Argentino and there's no telling what scuffle he got into." 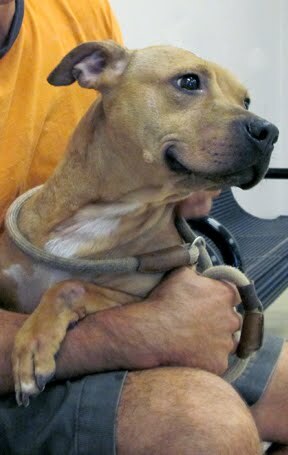 Explaining, "Dings on dog's faces don't necessarily point to organized dog fighting - or street fighting for that matter." I think I disappointed him, but frankly, we're like most cities with shelters crowded full of dogs who've simply lost their homes for a variety of unfortunate reasons. No doubt there are way too many unemployed urban youth with too much time on their hands embracing the gore sport. However, historically dog fighters in this country have been - and quite literally still are - snowball white. The bad guys can be counted as white high school science teachers, white female dog trainers, and even white humane investigators exposed on video for all to see. They're dotted around the country in pockets here and there, they're organized, and they're getting caught - as they should. The difference is, only one color of dog fighter is being coached on how to show compassion to animals and paraded on the Today Show. End Dog Fighting - of course. But a broader battle call should be to End the Ignorance before it infects policy makers in your town and sends untold numbers of dogs who've never been near a dog fight to their untimely deaths. 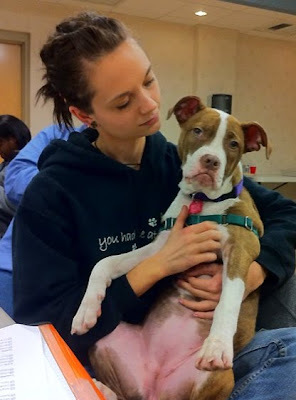 EDIT - The HSUS has since ended its "End Dogfighting" campaign and replaced it with the much more realistic and productive "Pets for Life" campaign. 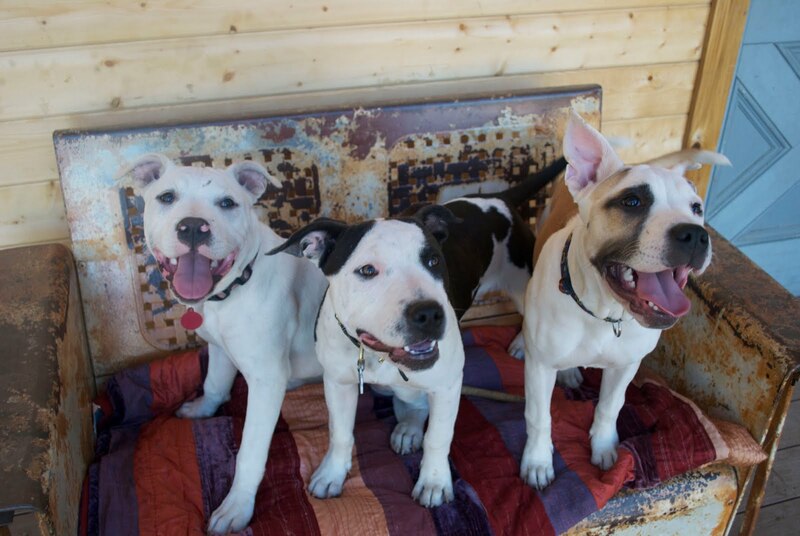 Bravo to them for recognizing that the 'guy in the ghetto' is not the enemy of the pit bull! 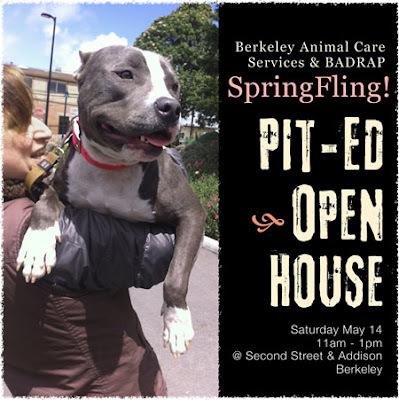 Spring Fling Open House - This Coming Saturday! It's time for another Open House during our Pit Ed classes. Come on down this Saturday May 14, and bring your friends. Please leave your dogs at home for this one, but bring your cameras! Saturday May 14 from 11:00-1pm. 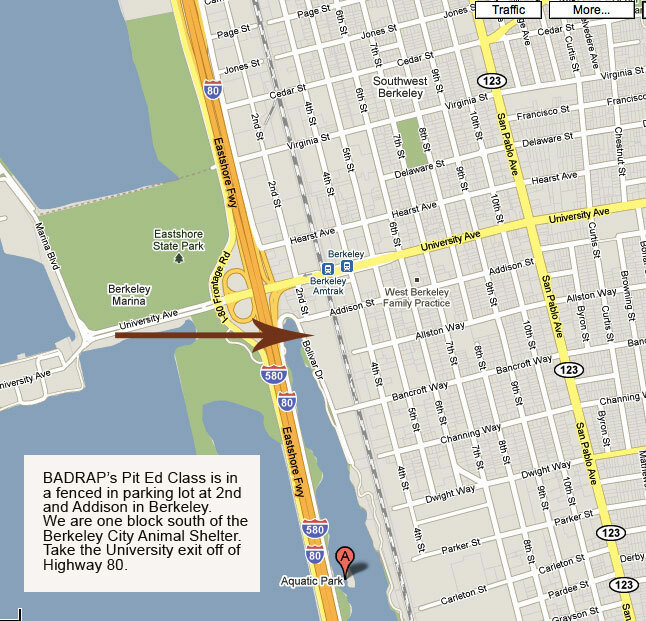 Training grounds are at Second Street and Addison in Berkeley, one block south of Berkeley Animal Care Services. Hope to see you soon! Josephine's parents sent us this photo today - marking the barn pups' first B-day - also May Day. She may not look too thrilled about all the fuss, but maybe she just wants to get on with it and open up all of her presents. Most are familiar with the pagan May Day ritual of dancing around the Maypole, but May Day can also refer to various labor celebrations conducted on May 1st to commemorate the fight for the eight hour day. Raising a litter of pups though is anything but an eight hour endeavour, however we can't complain since this was the cleanest litter of pups we'd ever met. I mean these five gals (and their two brothers) didn't even dirty themselves for weeks. Mom Eva likely had something to do with it, but from four to eight weeks of age they were impossibly clean. Then finally, one had a smudge on their side for a minute that actually needed human attention. I'm still amazed at how fastidious this entire group remained through to their adulthood. 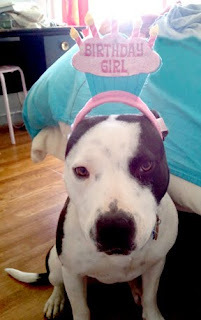 Above is a photo we took during the Unexpected Pit Bull Calendar shoot last year. We were quite fortunate to use their sweet donation from their 2011 calendar sales to add more kennel space and a much needed laundry room that we are finally painting while I write. We'll be posting photos soon of the finished addition. Happy One Year Birthday to the first ever residents of the barn. Like every good uncle, I have to say that while we absolutely loved having you here for a visit, it sure was great to send you home!